Bridgwater and Albion Rugby Football Club Youth Section is an open club for anyone aged 5 to 16 wishing to play Rugby Union in the Bridgwater area. 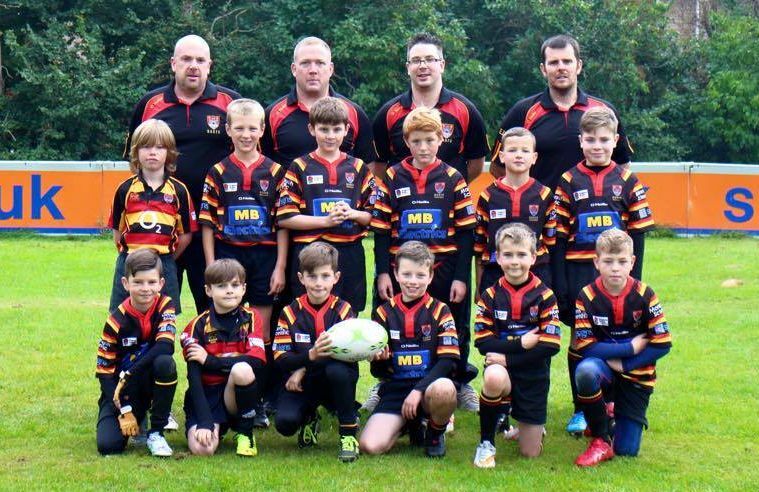 Originally founded in 1875, the club has continued to grow and now runs Colts, Junior and Mini teams in addition to Senior sides. We are an RFU Accredited Club which means that all of our coaches are RFU trained and qualified and that we have passed the necessary inspections from the RFU. We have an active development plan in place which is regularly checked and updated. In 2012/13 we adopted the new RFU rules for playing rugby which concentrate of 5 core values: Teamwork, Respect, Enjoyment, Discipline and Sportsmanship. This is reflected across all aspects of the Bridgwater & Albion Youth Section. What is Tag (or Mini) Rugby? Tag Rugby is played by 5 to 8 year olds on a small pitch. It is non-contact so players wear tags attached with Velcro that need to be pulled off by another player instead of being tackled. When a tag is removed, the ball should be passed. This allows the young players to concentrate on improving their ball handling skills and team play whilst also retaining the excitement and agility of the full game. We generally play one or two matches every other week – with the actual game lasting no more than 10 minutes each way. Midi Rugby is designed to be a progressive and controlled method of teaching basic Rugby skills so that by the age of 13, players are ready for the full 15-a-side game. Players are organised into four age groups – Under 9 to Under 12. In line with the latest English RFU continuum, the emphasis is on safety and tackling is not introduced until Under 9 level. Matches against other clubs take place roughly every other week, but the emphasis is very much on development of skills and enjoyment rather than purely results. At 13 years of age, players move up to junior rugby playing 15-a-side games on a full size pitch. Juniors play up to under 17’s when they can move into our Colts or Senior sides. The County run Junior sides from under 14’s onwards and players can be put forward for training and selection for County age groups. Bridgwater and Albion have an experienced pool of volunteer coaches, most of whom are parents and former players. RFU Coaching courses are run in Somerset every year to enable new parents or former players to become qualified to a recognised national standard. In addition and in conjunction with the RFU, Bridgwater & Albion host a number of CPD courses aimed at keeping Coaches and Team Mangers up to date. When Is Youth Rugby played? The season runs from the first Sunday in September until the last Sunday in April inclusively. If we are training or playing a match at home, we start at 10.00am and finish at 12:00 midday. If we are playing away we either meet at the club prior to the match or at the oppositions club. Directions are always available. Training and matches take place in all weathers, and we only cancel if the ground is waterlogged or frozen solid. Socks, black shorts and match shirts in Club Colours (Black, Red and Gold), are available. Rugby or football boots with the correct studs are required. Training jerseys can be purchased from team managers or sports shops. Gum shields and head guards are also recommended for all players in Under 9 and above. The RFU recommend that formulated mouth guards are purchased. It is suggested that parents seek the advice of coaches about any other equipment. All youth players have access to the Club’s changing rooms and showers after training and matches. The Club has a bar (open between 12 and 2pm on Sundays) which parents and children are welcome to use and hot drinks and bacon rolls are available for spectators to buy. After inter-club fixtures, food is provided for the children and their coaches. This is only available through parents/carers volunteering to help in the kitchen. A rota is organised for this at the beginning of the season. First player membership is £35; this covers one playing child for use of club facilities, RFU insurance and social membership to the club for parents or guardians. Further children from the same family are then £20 for the season. There are no other costs throughout the season. How can parents/carers get involved? B&ARFC Youth Section is run entirely by volunteers and we rely on these volunteers to keep the Youth Section running. There are therefore many ways that Parents, Carers, Relatives or Friends can get involved such as First Aiders, Helping prepare/serve food for match days, Joining/helping the Committee, Team Management or even Coaching. No experience is necessary as the Club can help in all aspects and even provide Coaching courses (leading to qualifications) if required. Please note that anyone coming into regular contact with the Children will need to undergo a CRB check that will be organised and paid for by the Club. What Other Events Take Place? We currently run a number of events throughout the year for families e.g. Christmas Party, fund raising activities, awards night etc. There will be a ‘Parents’ meeting after the first training session in September. The older team also arrange short tours to other parts of the country towards the end of season. There are opportunities for both corporate and individual sponsorship of the Youth Section. We welcome any approaches from companies or individuals wishing to support us through sponsorship. We are always pleased to consider modest sponsorship proposals. You are Welcome to come down to the Club any Sunday Morning between September and April, contact the relevant Team Manager or click here to view more details about joining us.